We had been cleaning up during a rainy day at my father's in Orem, Utah. There was a break in the rain and the sun came out. I knew it was the best time to hit the road for our annual trip up Utah State Route 92, otherwise known as The Alpine Loop. 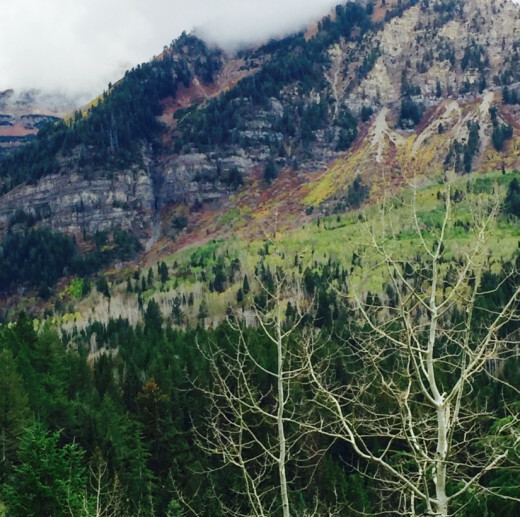 It is a scenic drive from Provo Canyon to American Fork Canyon or vice versa, a 20 mile breathtaking drive through the Uintah National Forest. I promise you won't be disappointed. 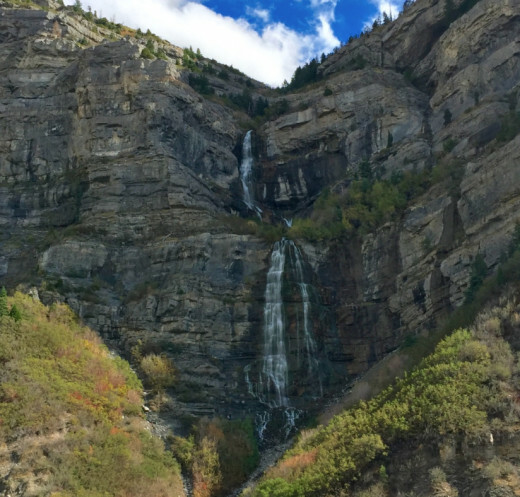 Getting closer to the turn off for the Alpine Loop, we were able to get a fine look at Bridal Veil Falls. Since I grew up in this area, this is a very familiar site for me, but it never gets old. Who hasn't heard of Robert Redford and Sundance? After the turn off US 189, you soon come to one of my favorite ski resorts, Sundance. No snow yet, but you never know when it will arrive, sometimes late October, earlier or later. When I used to ski, it was a favorite place to hang out. But, this time, it was all about the autumn leaves, so on we traveled. While we were making our way up to higher altitudes, all of a sudden there were two deer right on the side of the road. Lucky I was able to catch a photo of them. 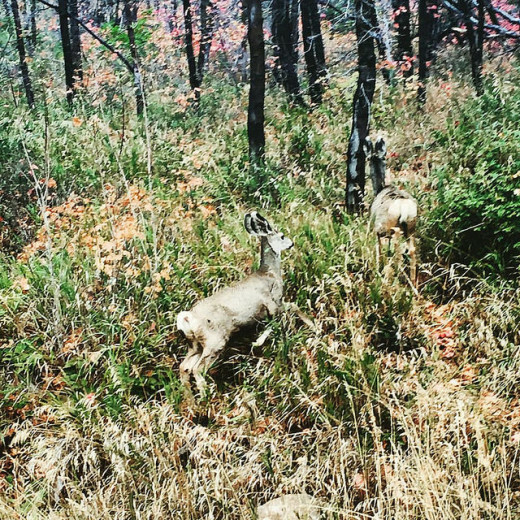 Deer on the trail - who was most surprised? You know you have come near the top when you come to the Aspen tree forest. 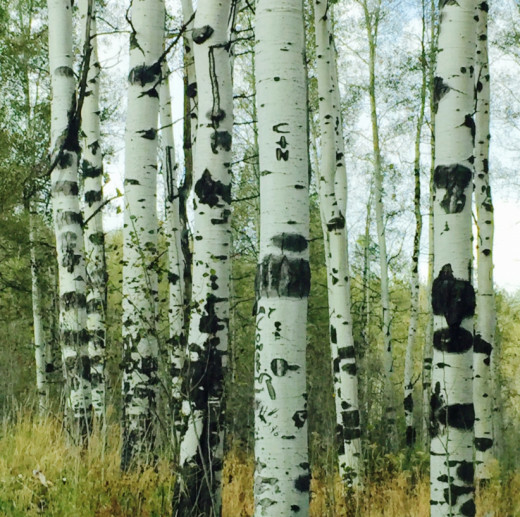 Feels like you just traveled to another world - short, tall, and in between, the aspen trees are mesmerizing. You can catch a few where initials have been carved into the trees. Makes you wonder about the story behind it - were they lovers? 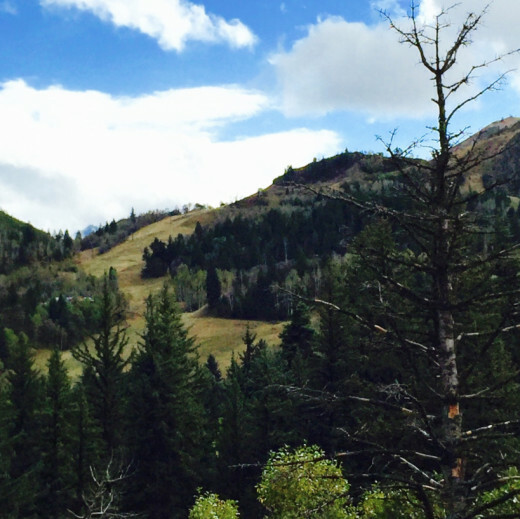 The Alpine Loop is only open from May through October, so it is good to schedule a trip during those months. There are turn offs so you can stop and take some photos of all the beauty. 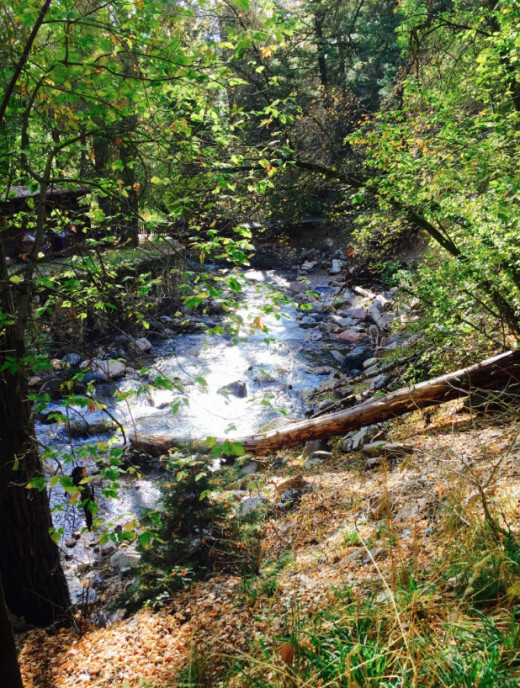 Cascade Springs can be seen through the trees, and then you can turn off and get a closer view further on. The entrance to the trail to Timpanogos Cave National Monument is along the road as well. If you want a great hike, this is the place. The ride didn't last long enough, but if you decide you want to stay longer, you can bring your camper and pay $6 pass good for 3 days; a $12 pass is good for 7 days; there is also a $45 annual pass available in case you want to get away from all the hustle and bustle. 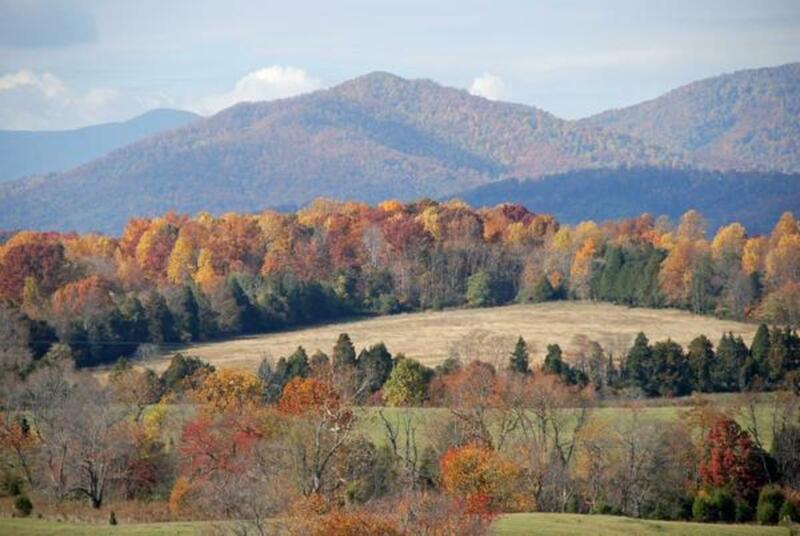 Autumn Colors in Forest Virginia - site of Thomas Jefferson's Poplar Forest home. I agree @RTalloni. 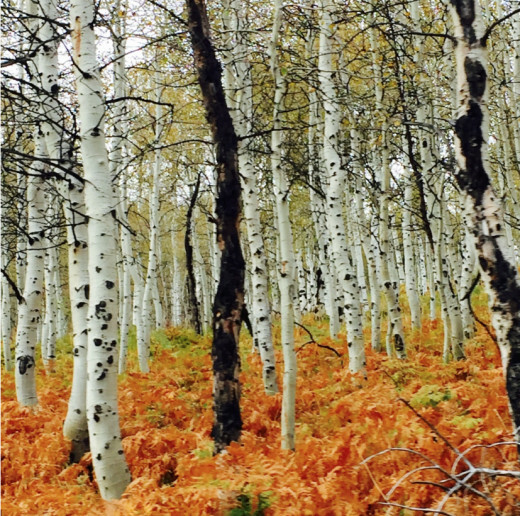 The aspens are beautiful! The aspens are inspiring, making me want to paint. 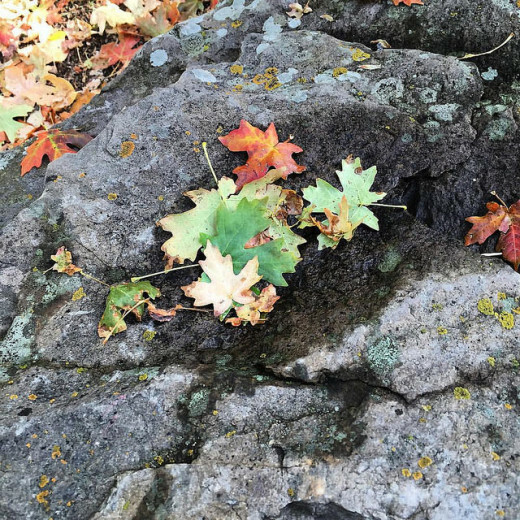 Thanks for sharing some of your fall trip! Thank you @poetryman6969! Glad you enjoy them.